Russian President Vladimir Putin hit out at “discrimination” against the country’s banned track and field athletes at a Kremlin send-off ceremony Wednesday for its depleted Olympic team. MOSCOW — Russian President Vladimir Putin hit out at “discrimination” against the country’s banned track and field athletes at a Kremlin send-off ceremony Wednesday for its depleted Olympic team. Fencers and triathletes became the latest team of Russians to be cleared to compete in the Olympics by their sports’ governing bodies ahead of the Moscow ceremony, but the IAAF rejected a bid by the bulk of the track and field team to be reinstated. Putin said the athletes banned from the Olympics were victims of a campaign to present Russian sports in a bad light. 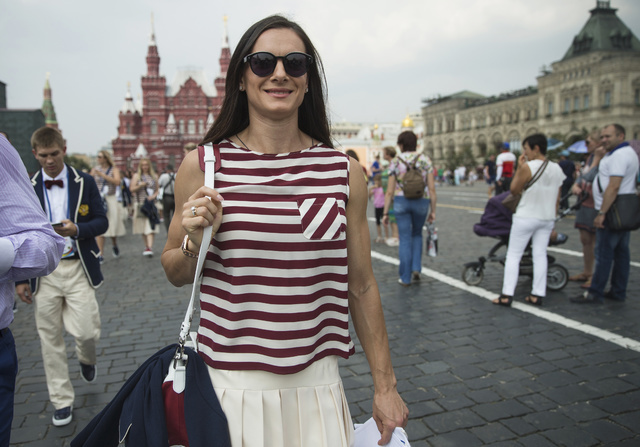 He spoke with two-time Olympic pole-vaulting champion Yelena Isinbayeva, the most high-profile of the 67 track and field athletes banned from the games, standing beside him. 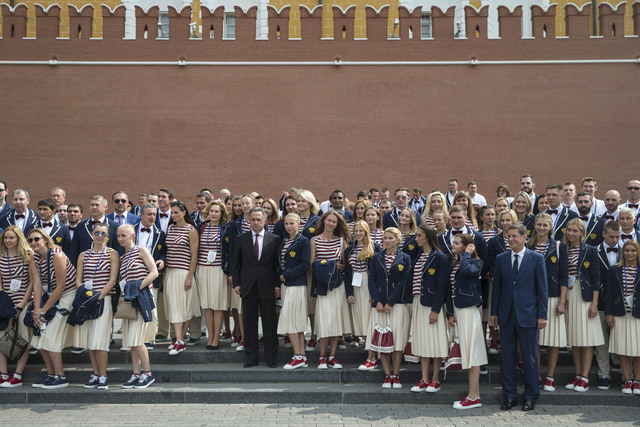 As the athletes walked across Red Square to meet Putin, some posed for selfies with Vitaly Mutko, whose sports ministry was accused by the World Anti-Doping Agency of orchestrating the doping cover-up. The sports minister has been blocked by the International Olympic Committee from attending the games next month but he remains in Putin’s government. “The situation went beyond the legal field as well as common sense,” Putin told the audience, which included many of the banned athletes. “It’s a well-planned campaign which targeted our athletes, which included double-standards and the concept of collective punishment which has nothing to do with justice or even basic legal norms. There was positive news, however, from Putin’s ally, Alisher Usmanov, the Russian billionaire who is president of the International Fencing Federation. The FIE did not respond to questions from The Associated Press about whether WADA investigator Richard McLaren’s evidence was considered before deciding to allow Russian fencers to compete in Rio. The International Triathlon Union said the three men and three women who qualified for Rio are not mentioned in the McLaren report and have not served past doping suspensions. The International Gymnastics Federation said it has established a “pool of eligible Russian athletes” and is awaiting IOC approval. Individual sports federations were given the task of deciding which athletes should be cleared to compete in Rio by the International Olympic Committee on Sunday. In his native Germany, IOC President Thomas Bach is facing increasing criticism for failing to impose a complete ban on Russia’s team. This story has been corrected to show that Isinbayeva’s first name is Yelena, not Irina. Harris reported from London. AP Sports Writer Nesha Starcevic in Frankfurt, Germany contributed to this report.